You gotta love puppies! They are so full of zest, life, and curiosity. They also are notorious for putting everything in their mouths! First, it’s normal puppy behavior. You are unlikely to have a demon puppy and he probably doesn’t hate you. 😉 But that’s not to say it’s fun to have your pants chewed on or your robe tugged. I want to tackle two common targets in puppy mouthing: bathrobes and pant legs or feet. Just look at how your bathrobe flows back and forth. It’s so mesmerizing, enticing, and so much fun to chew on! Puppies seem to be hard-wired to grab the flowing bottom of a bathrobe, then growl and tug and chew as you try to walk from one part of the house to another. Besides it being such a great item to play with, I think there are a few other things at play on why puppies just love to bite and chew on those robes. Timing: My guess is the time you are wearing your super-exciting bathrobe, is either in the morning or evening. These are two times during the day when a puppy seems to be on high-alert and full of himself (read: puppy zoomies). Movement: It’s just so exciting! The movement of the robe or feet is just too hard to resist. Your Reaction: Do you holler, screech, or try swatting at your puppy when he does grab your robe? 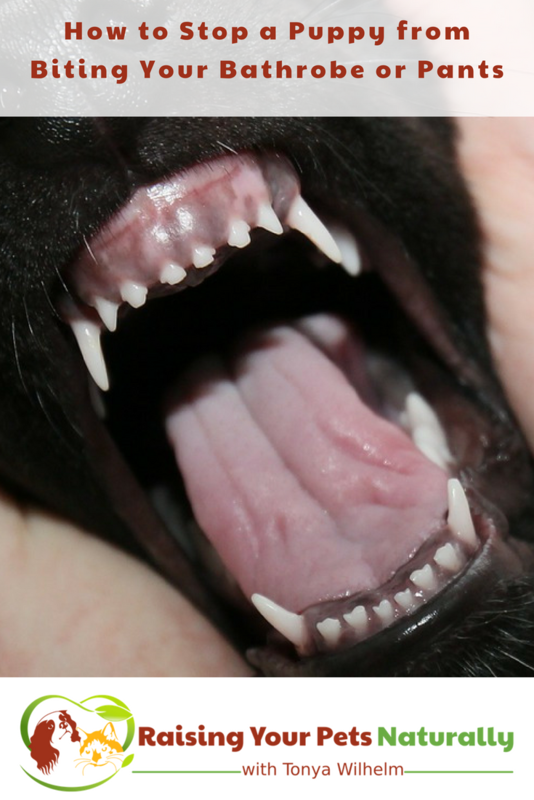 These are all sure-fire ways to get your puppy to bite and chew even harder! Not Enough Proper Puppy Entertainment: In general, when a puppy has plenty of appropriate chewies, play, exercise, and family time, they aren’t as hard-wired to “look” for other ways to entertain themselves. More Appropriate Puppy Entertainment and Exercise: Sorry. These little bundles of energy tend to need more than we think they would. Whenever I have a client with a puppy biting problem, the first thing we discuss is upping the puppy games. Take what you are currently doing with your puppy and double it! Maybe not doubling the actual time of your fetch games, but doubling the quantity of them. So, if you play games with your puppy four times a day, go to eight. This increase in bonding and activity usually helps to decrease the puppy’s need to find other fun things to do, like biting your bathrobe, pants, or feet. 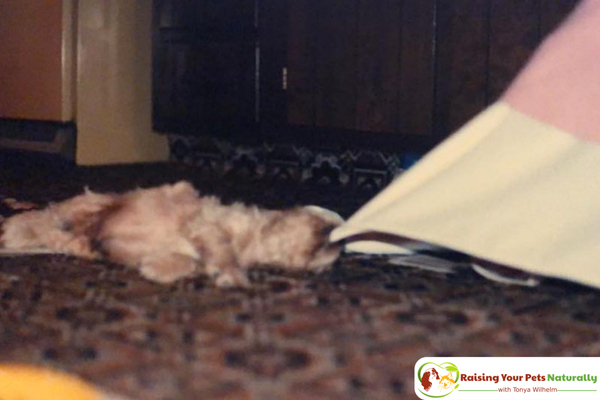 Plan for Success and Change The Puppy’s Routine: My guess is that puppy parents can usually anticipate the situation or time their puppy is more likely to be biting and nipping. Say your puppy grabs and bites your bathrobe in the morning when you are in your bedroom and bath. Keep some healthy dog treats on your dresser at all times, or in your pocket if your puppy is biting your pant legs. Instead of waiting for your puppy to come barreling at you with teeth bared, drop a treat right in front of his nose. Drop another one right after he eats the first, then another and another. Leave a cookie trail of treats. What you are doing, is changing your puppy’s routine from running and biting, to eating treats. 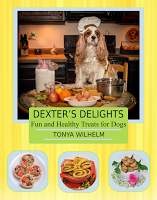 Don’t forget to count those treats as part of your puppy’s daily calorie allotment. As the days go by, keep up with this routine until you see the grabbing of your bathrobe stop and your puppy looking at you for treats. Now, it’s time to reduce the treat dropping little by little until you fade the routine of dropping treats to just talking calmly with your puppy, or providing him with a filled hollow toy or bone. 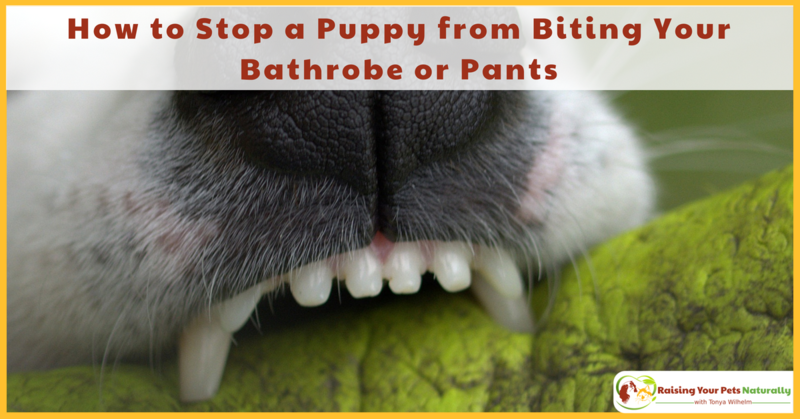 There are three main objectives to make your puppy stop biting your robe or feet. One, you are going to double his interactive activity. This will help provide him with the appropriate games and activities, and help tire him out. That in turn, will reduce the likelihood of him looking for fun things on his own time. Two, you are going to change his current pattern of grabbing your robe or feet to eating a treat trail of healthy dog treats (dehydrated meat works well). Eventually, as his new routine of eating treats becomes a habit, you will fade the treat trail. Third, you are waiting for your puppy’s brain to mature (about 2 years of age) and to outgrow all his crazy puppy antics. The three together make this behavior a cinch to stop! For more tips on puppy mouthing and biting, read How to Stop a Puppy From Biting and Mouthing. You may also enjoy How to Train a Puppy Not to Bite the Leash. Does your puppy like to bite your pants or bathrobe? Tell me in the comments.